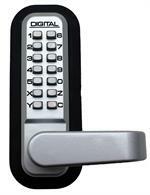 Lockey Keyless Mechanical Digital Door Locks provide keyless security for your home or business. These locks are mechanical so they do not need batteries or electricity. 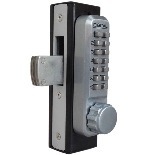 All Lockey Locks purchased without a key override are bump proof and pick proof. They are easy to install and easy to use. The combination is easily changed. They are weather resistant and all carry a manufacturer warranty. 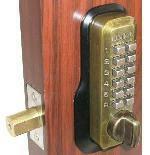 Lockey Makes The Finest Mechanical Locks On The Planet. They Are Pick Proof, Bump Proof and Can Accomdate The Code You Choose. Narrow Your Search By Choosing a Category That Fits Your Search. Lockey Cabinet Locks are Small, Lightweight, Low-Profile Keyless locks That Are Ideal for Childproofing Homes, Securing Cabinets, Sliding Glass Doors, Bi-Fold Doors and More. 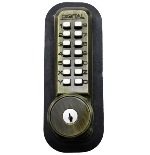 Lockey Deadbolt Locks Provide Maximum Security. All Include Mechanical Combinations. Key Override is Also Available. Models Available for Residential, Gates, Commercial, Retail and More. 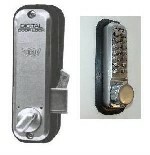 Lockey Double Sided Locks Require a Combination to be Entered When Entering Or Leaving. 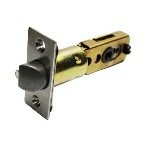 Ideal for Doors With Glass Panes That Can Be Broken To Gain Entry. 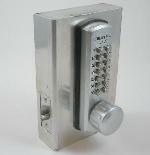 Lockey Key Override Locks are Perfect for Multi Unit Installations Where Master Key Access is Required. Each Unit Owner Can Have An Individual Code While Management Has Full Access. 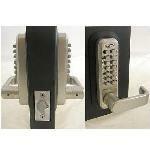 Lockey Lever Handle Locks Are ADA Compliant and Allow for Single Hand Opening Of a Door or Gate. Many of These Locks Offer a Passage Function For Free Exit Or Entry. 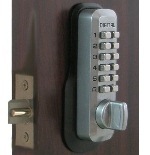 Lockey Marine Grade Locks Are Perfect for Beach Gates, Doors Near the Beach, and On Board a Boat. The Finish Closely Resembles the Satin Chrome Color. Lockey Narrow Stile Series Keyless Locks Systems For Use on Narrow-Stile Doors.Â Designed Specifically to Replace Existing Adams-Rite Systems it is Ideal For Aluminum Storefront Doors As Well As Chain Link, Steel and Aluminum Gates. Lockey Parts and Accessories to Complete Your Installation, Cover Old Holes, and Make It Easier To Use Your Lock. 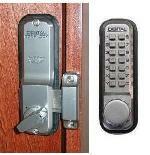 Lockey Sliding Door Locks Use a Hook Bolt to Secure Pocket Doors, Sliding Gates, Trailer Doors and More. Let Us Help You Choose the Right One For Your Door or Gate. 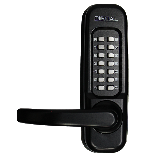 Lockey Keyless Spring Latch Locks Lock Automatically When You Close The Door. You'll Never Wonder If You Locked Your Door or Not. Many Have Passage Function for Events or Parties. Double Sided is Available. 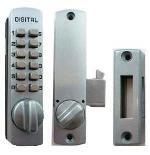 Lockey Surface Mount Locks Fit When Your Door or Gate Can't Accept a Standard Mortise Lock Or is Very Thin. Great for Storm Doors, Trailer Doors, Cabinets and Closets.